It’s never nice to see a fellow super saver make a howler. But Brad Guzan, hang your head in shame! If you haven’t seen his costly error, it is well worth a wee Google (other search engines are available). 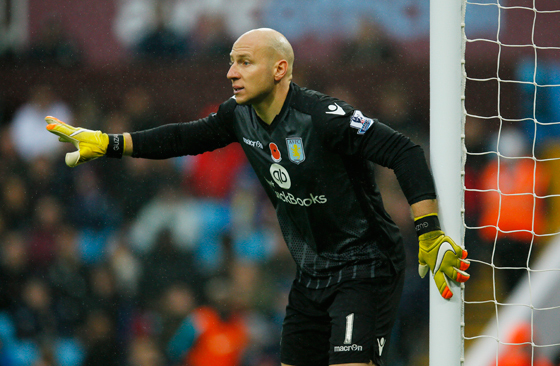 Guzan (pictured) may have just cost his team their place in the Premier League. They now must win every game just to reach 40 points, the magic number to achieve survival, usually. And despite winning the shots on target battle against Swansea, Villa remain stranded at the foot of the table. Meanwhile, Premier League stalwart and top super saver Tim Howard has announced he will move on from Everton at the end of the season. He’s off to join the Colorado Rapids! And while he hasn’t always been a fan favourite for the Toffees, he sure has helped his team this season – so far helping his side to be three places better off in the Premier League. If it weren’t for the big American at times, Everton would be facing a real battle with relegation. Tim Howard, Bob Friendly salutes you! As we head into the international break, here is how our alternative league table looks.